The following sub-races are available to any pony, and can be paired with spiritual paths for a number of combinations. Please see the sub-race and tribe section for more information on each of these character options. Earth-Bound ponies lack the impressive abilities of the other pony types, but they are nonetheless tougher and hardier than most other ponies. Like a Weed: You have advantage on saving throws against poison, and you have resistance against poison damage. Tougher than Magic. You have advantage on Strength, Dexterity, or Constitution saving throws against magic spells and effects. These feather-winged ponies soar through the sunny skies, gliding vigilantly for the benefit of all. Flight: Your base flying speed is 30 feet. You cannot fly if you are wearing armor you are not proficient in, armor not tailored to accommodate your wings, or a backpack not specially tailored to your wings. While flying, you have disadvantage on strength checks to interact with objects that are on the ground. You fall to the ground at the end of your turn unless you move at least half your fly speed during your turn. Cloud Walker: May treat fog, or any other cloud, as solid ground for purposes of taking walks, playing games, improvised weapons, and so on. 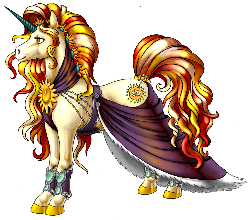 These inherently magical horned ponies leverage their mystical link and intelligence to great effect. Kinetic Magic: You know the light and mage hand cantrips. Intelligence is your spellcasting ability for these spells. Elegant Spellcaster: You can use your reaction to gain advantage on Constitution saving throws to avoid losing concentration on a spell. The following are rarer breeds of pony. Their bloodlines have thinned over the centuries, and it is rare to see a full family of the same uncommon breed. Instead, they crop up unexpectedly in other pony communities. Your tribe shook loose the shackles of the physical body, and slipped their whole form into the ethers. Even at your height, your tribe was rare and difficult to find, and that suited ghost ponies just fine. Reclusive, but inquisitive, ghost ponies make natural spellcasters, devoting much of their time to contemplation and exploration of thoughts. In appearance, ghost ponies are slender and tall. They appear like deer with their delicate limbs. Their coloration tends towards shades of blue and purple when in the physical world and becoming a pale white in the ethers. Despite their claims to be creatures of the ether, ghost ponies are born in the material plane. It requires much maturation and training, or an expensive magic item, to enable them to reach into the ether, though it comes easier to them than it does most others. Ghost pony families are typically small, with a male and female pair and only one or two foals. Many families pass down ghost hooks to their young when they are old enough to speak, and a harness when they are ready to become adults. The creation or purchase of a harness is often considered the first step in making a family, as not having one to give to your son or daughter is a sign of true poverty and irresponsibility. Their society favors mental pursuits, seeing the material plane as a necessary burden and sin, only to be bothered with for such base needs as reproduction. This aloof doctrine is the primary reason that ghost ponies are not seen often by the physical tribes. Young members, who still know the physical plane as well as, if not better than, the ethereal plane may feel the draw of the physical tribes. It is these immature souls that may take up the mantle of adventurer and seek their fortune in the solid world, much to their parents’ dismay. Takes One to Know One: You can sense other incorporeal creatures as far as 30 feet as if you had blindsight. This ability is not blocked by solid objects. Spirit Touch: Physical attacks that you make are considered magical for the purposes of bypassing damage resistances of incorporeal creatures. Leather wings and griffons share a fractious history. When the mountain tribes came to cohabitate the griffon lands, some ponies admired and eventually emulated the griffons, joining them in the sky and becoming fast friends and allies. Others retreated into their caves all the deeper, seeking to avoid the dangerous and wild griffons, to say nothing of other threats from the outside world. Leather wings still tend to treat griffons and other aerial predators with a large helping of caution, leading to tense relations. Physically, leather wings are built more solidly than pegasi. Their hardy forms are framed by large leathery wings that work well underground. Their eyes pierce the gloom of their home, which they find more comfortable than the harsh sun above. At home with the darkness, leather wings worship the night gods over the day ones, and consider them always close at hand. Their nature is intimidating to other ponykind, which caused them to be shunned and secluded even at the height of pony civilization. Some leather wings think this is for the best: they persisted even after the empire crumbled, their personal lives unaffected by the destruction that befell their sun-loving kin. Having adapted for underground living, the diet of leather wings includes more meat than their grazing kin, making them omnivores. Flight: ​Your base flying speed is 30 feet. You cannot fly if you are wearing armor you are not proficient in, armor not tailored to accommodate your wings, or a backpack not specially tailored to your wings. While flying, you have disadvantage on strength checks to interact with objects that are on the ground. You fall to the ground at the end of your turn unless you move at least half your fly speed during your turn. In Darkness Thrive: You have Darkvision 90 ft., but have disadvantage to saving throws against light-based effects. Not all ponies were content to run across the land. One tribe dove into the sea, finding it full of food and safety from land predators. Though these tribes often built towns at the edge of the water, they were most happy when slicing through the waves rather than on their dry streets. While the sea was rich in food and some valuables, such as pearls and coral, they lacked in metals. This drove the sea horses to adopt trading early. They learned to build grand ships to ferry their goods, or other, less aquatically mobile, tribes, from place to place. There are stories amongst the sea horses that a small number of their people forgot to come back to land at all and now call the oceans their home. Such ponies are dangerous and wild. They have forgotten their kinship to all other tribes and should be avoided. It became a common prayer before a journey for sea horses to hope against the appearance of such ocean breeds, for they revel in the destruction of sea horse ships. After the empire declined, the line of the already uncommon sea horse became increasingly diluted, until the only sighting of them came in the sudden birth of one in an unrelated family. A pairing of land tribes had a chance of conceiving a sea horse due to long forgotten ancestry shared with the lost tribe. While some sea horses dream of rekindling their kind, most think it is very unlikely. Ability Score Increase: Increase your Strength score by 1. Swim: You gain a swimming speed of 40 ft.
Amphibious: You can breathe air and water. Deep Swimmer: You have Darkvision 120 ft. When ponykind was young, one tribe did not specialize, and chose instead to worship the whole of nature. They took a holistic approach to other mysteries of life and it reflects in their society. Being hermits, many live alone or in small villages. They study the traditional ways of their parents, exploring their place in the universe at large while seeking better ways to pass on their knowledge. They find the slavish devotion of other ponykind to their singular destinies to be a childish limitation. The frantic rush that ponies indulge in is distracting, even bothersome. Most zebra prefer to consider a problem first, and approach with planning and care. Though reverent of their predecessors’ traditions, every zebra is unique. The brand of destiny manifests much differently for zebra compared to other ponykind. It changes shape and color as the zebra gains, or loses, understanding of herself. It is often a pattern, rather than a clear image, and its meaning is only evident to the zebra that bears it. Other zebras can examine such a brand and with DC 20 Intelligence(arcana) check, gain advantage on insight checks against that zebra until the brand changes. If a zebra has deciphered a brand before, doing so again allows the zebra to recognize the brand, and its bearer, even if the target zebra is disguised or the brand has changed since the last viewing. While one could glean hints as to any ponykind’s nature by their brand, the intricate nature of a zebra’s pattern is much more detailed for those who know how to read it. Rather than the solid colors or dappled freckles of other ponykind, solid stripes cover zebra forms. Though black and white are most common, some zebra take on the wild and bright shades more commonly seen in other ponykind. Ability Score Increase: Your Intelligence score increases by 1 and your Wisdom score increases by 1. Driven by Curiosity: You gain proficiency in one skill and one tool. Natural Linguist: You know an additional language, and gain advantage on any rolls to decipher written text.